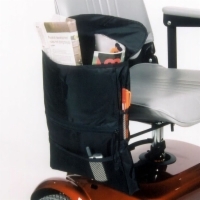 Never again worry about needing storage space on the go while using your electric scooter or power wheelchair - A1 Medical Supplies carries five varieties of armrest bags which are compatible with any scooter or wheelchair and easy as pie to mount onto your mobility device. 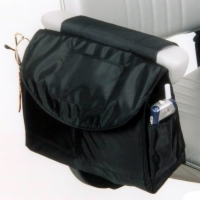 The Armrest Pocket Bag is small enough to attach to manual wheelchairs without getting in the way of the wheels but is large enough to store items such as keys, cell phones, and wallets. Perfect for keys, cell phones, wallets, etc. 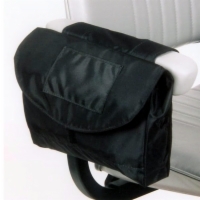 The Standard Saddle Bag is a one pocket bag that mounts to the armrest of your mobility device. 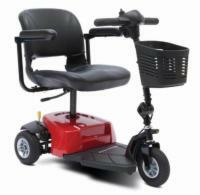 It can be mounted on the inside or outside of the armrest. 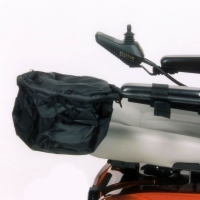 The Deluxe Saddle Bag is a three pocket bag. One main pocket plus a side pocket and a zippered interior pocket make it easy to keep your valuables organized. The Extra Large Saddle Bag is a multiple pocket bag that offers an incredible amount of storage space. Size: 12" x 16" x 2"
The Front Bag is a one pocket bag with zippered top and aluminum frame that allows you to keep the bag in the open position. It is approximately the size of a basketball and mounts to the end of your armrest.